As President Obama presses Congress to pass legislation mandating paid employee sick leave, states like California have signed into law AB 1522, which becomes effective July 1, 2015. How might changing Labor Codes effect your business? The Harvard Business Review published a graphic showing how employee benefits have changed over the past 20 years (to read the full article click (here). Most employees (exempt and non-exempt) who work in California for at least 30 days are entitled to paid sick days at the employee’s regular rate of pay. This includes temporary, part-time, and seasonal employees who work 30 or more days within a year from the date they are first hired. 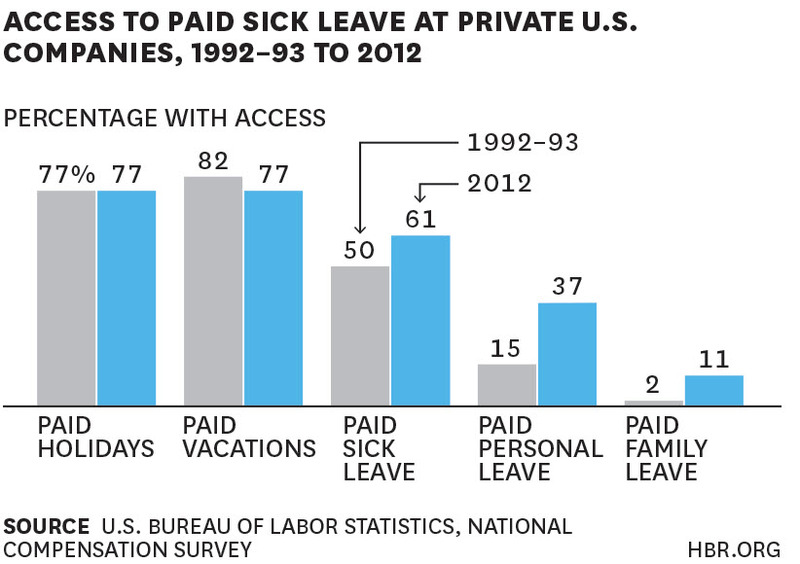 Paid sick days accrue at a rate of no less than one hour for every 30 hours worked. An employer can limit an employee’s use of paid sick days to 3 days (24 work hours) per year. An employee is entitled to use accrued sick days beginning on the 90th day of employment. Employers are prohibited from discriminating or retaliating against an employee who requests paid sick days. For more detailed information about how to ensure compliance, visit the Califormia Department of Industrial Relations here. How might this effect you? As a business owner, you are responsible for remaining in compliance with all federal and state laws. Make sure that you stay abreast of new payroll taxes and legislation in all states where your business maintains employees. If you use Sage 300 Payroll, to comply with the new California law, you may have to setup a new earning code for sick time and will have to ensure that employees either accrue or receive an appropriate number of hours. You may also wish to track the cost of this new benefit in your general ledger. Finally, the law requires that employees are kept informed of the number of hours they have available. This may require a modification to your payroll check form to ensure that the information is visible and easily accessible. If you would like to know more about how these changing rules may affect your specific Sage 300 environment, please contact Equation Technologies today. Equation Technologies is a certified Sage partner and an expert in Sage HRMS and Payroll.